Afghan President Hamid Karzai has taken a wider lead in the race for the country’s top office, according to vote tallies released Saturday. The incumbent has 940,558 votes, with his nearest rival, Abdullah Abdullah, garnering 638,924 votes. Ramazan Bashardost was running third with 277,404 votes, said Afghanistan’s Independent Election Commission. Thirty-five percent of the votes have been counted in the August 20 ballot. Final results are not expected until September. If no candidate wins more than 50 percent of votes, there will be a runoff between the top two contenders, most likely in mid-October. 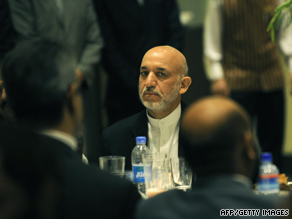 Karzai has 46 percent and Abdullah 31 percent of the 2.03 million votes deemed valid so far by election officials. Election complaints could hold up the official results. Afghan officials monitoring the presidential and provincial elections said this week that 1,740 complaints were filed on and after the polling day, with 270 deemed major. Election complaints included polling irregularities, voter intimidation and ballot stuffing. The Electoral Complaints Commission said it must resolve the complaints for election results to be certified. Abdullah has accused Karzai of rigging the elections in his favor. Six other presidential candidates did not point any fingers at the incumbent, but they did call for an investigation into “widespread fraud and intimidation” that they said could cast doubt on the legitimacy of the vote.